Columbus is a city surrounded by rich farmland and dotted with urban gardens and local businesses, meaning residents and visitors alike get to enjoy the bounty through the farmers markets that pop up in every neighborhood. Here’s your 2018 guide to the city’s markets, organized by day of the week. The Hilliard Farm Market meets Tuesdays from 4-7 p.m., through Sept. 11. Vendors have sold everything from cakes, sauces and root beer floats to flowers and garden plants, to honey, fish and cheese. Find it: Hilliard United Methodist Church, 5445 Scioto Darby Rd. During the Pearl Market on Tuesdays and Fridays from 10:30 a.m. to 2 p.m. through Oct. 12, you’ll discover locally grown produce, fresh foods, local food trucks, and hand-made merchandise. Because of construction on the Rhodes Tower, the market has re-located for the season to the North Plaza of the Ohio Statehouse. Franklin Park Conservatory & Botanical Gardens Farmers’ Market is every Wednesday from 3:30-6:30 p.m. through Sept. 5, held outdoors in the parking lot. The conservatory hosts vendors with seasonal fruits and veggies, baked goods, meats, dairy and home products like candles and soap. Local food trucks are usually present, and families can enjoy kid’s activities and cooking demos. Find it: Franklin Park Conservatory, 1777 E. Broad St. The Upper Arlington Farmers’ Market runs Wednesdays from 3-6 p.m. through September 26. It meets in front of the U.A. Senior Center and includes plenty of market stands and hand-made goods. Find it: Upper Arlington Senior Center, 1945 Ridgeview Rd. The Uptown Westerville Farmers’ Market is every Wednesday from 3-6 p.m. from May to October. A number of farms and vendors are all represented, offering everything from fresh produce to honey to pasta to sweet treats. 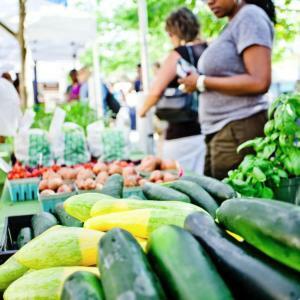 The Nationwide-Pearl Alley Growers’ Association Farmers Market on the Plaza takes place in the Arena District Thursdays from 11 a.m. to 1 p.m. July through October. Offerings include an ever-changing variety of fruit & vegetables, honey, fresh kettle corn and more. 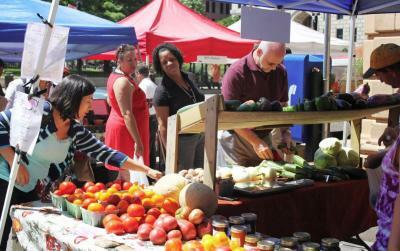 The Bexley Farmers’ Market operates Thursdays from 4-7 p.m. at East Main Street and Dawson Ave. 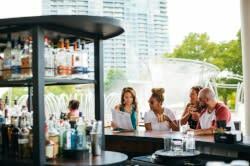 In addition to buying all the classic market goods, visitors can experience live music, children’s events and food trucks. Find it: 2111 E. Main St. 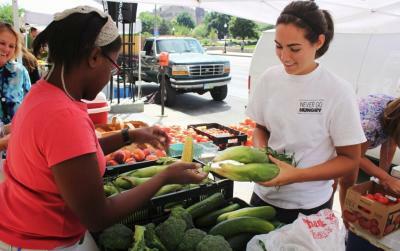 The new Bronzeville Growers Market meets Thursdays from 3-6 p.m. through September 27. It’s hosted by century-old Bethany Presbyterian Church, and features produce from their community garden as well as local food providers. Find it: 925 Mt. Vernon Ave.
New Albany Farmers Market is an outdoor market featuring live music, food trucks and plenty of fresh goods at the market square, every Thursday, 4-7 p.m. through September 6. During the Pearl Market on Tuesdays and Fridays from 10:30 a.m. to 2 p.m. through Oct. 12, you’ll discover locally grown produce, fresh foods, local food trucks and hand-made merchandise. Because of construction on the Rhodes Tower, the market has re-located for the season to the North Plaza of the Ohio Statehouse. The Clintonville Farmers’ Market is “Where you can meet the farmers!” The outdoor market in the heart of Clintonville meets on Saturdays from 9 a.m. to noon through November 17. Find it: North High St. between Orchard Ln. and W. Dunedin Ave. Located in historic downtown Canal Winchester, the Canal Winchester Farmers’ Market features plenty of Ohio fruits and vegetables, as well as breads, clothing, soaps, fudge, wood products, and much more. After taking a year’s hiatus, the farmers market returns to Dublin as The Dublin Market at Bridge Park. Held Saturdays from 9 a.m. to noon, the market features live music, fresh produce, skincare items, snacks, sweets and more. Find it: Longshore St. between Tuller Ridge Dr. and Bridge Park Ave.
Trek along Broadway in downtown Grove City from 8 a.m. to noon on Saturdays through September 8, to find all the market goods like gifts, produce, honey and crafts at the Grove City Area Chamber of Commerce’s Farmers’ Market. Billing itself the “Original Farmers’ Market,” the North Market Farmers’ Market features local farms selling honey, fruits, vegetables, flowers, herbs and more. Enjoy live music at the market, and when you’re done – head inside for lunch! 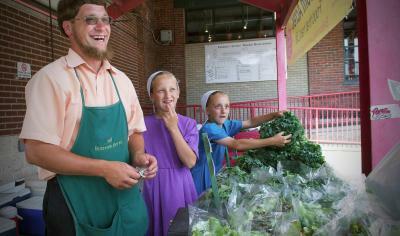 The farmers’ market is open 8 a.m. to 1 p.m. Saturdays and now 10 a.m. to 3 p.m. Sundays. Find it: 59 Spruce St. The Westgate Farmers Market runs the first and third Saturday of the month from June to October. It’s hosted from 9 a.m. to 1 p.m.; hit it up for fresh produce, locally made crafts and food trucks! Find it: Westgate Masonic Lodge, 2925 W. Broad St. The new Linden Farmers’ Market meets Sundays from 1-4 p.m. through Aug. 26, bringing fresh produce from local farmers and food growers. Find it: 2830 Cleveland Ave. In addition to their regular Saturday hours, the North Market Farmers’ Market is now 10 a.m. to 3 p.m. every Sunday.